You are seeing this message because you were subscribed to the NYU Development Research Institute blog (formerly the Aid Watch blog). 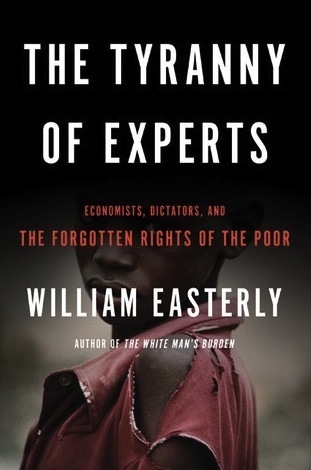 We are no longer publishing posts at this site, but wanted to invite you to the launch of Professor Easterly’s new book, The Tyranny of Experts: Economists, Dictators and the Forgotten Rights of the Poor. The event will take place at 6pm on Monday March 3, 2014 at the Great Hall at Cooper Union, New York City. Find more details and register here. Thanks and we hope you’ll stay in touch! Is there rigorous evidence that anyone will use rigorous evidence? A new study using 1,419 micro-finance NGOs as subjects created two treatment groups. In the positive treatment subjects were randomly assigned to receive a summary of a study by prominent authors finding that microcredit is effective. The negative treatment provided information on research – by the same authors using a very similar design – reporting the ineffectiveness of microcredit. We compare both conditions to a control in which no studies were cited. The positive treatment elicited twice as many responses as the negative treatment – and significantly more acceptances of our invitation to consider partnering on an evaluation of their program. Tanzania looks an awful lot like a democracy. The East African nation has been holding multi-party elections since 1995, which international observers have deemed free and competitive. In Tanzania, votes are not miscounted, opposition parties compete actively, and the ruling party—the Chama Cha Mapinduzi (CCM), which has controlled the government since independence—seems to play by the rules. But according to Bruce Bueno de Mesquita, NYU politics professor and DRI affiliated faculty member, Tanzania is in fact sliding down a slippery slope to autocracy, even as it maintains the trappings of a “transitioning” democracy. A working paper with Alastair Smith describes how Tanzania’s completely legal and institutionalized electoral laws are placing power in the hands of a small and increasingly entrenched elite. The Development of Freedom since 1776 has been about including more and more men and women in that word “all”. How much do Europeans account for economic development? European settlement had a longstanding positive effect on economic development in countries that were colonies, notwithstanding the terrible effects of Western diseases and political oppression that often resulted, according to new research. The paper, titled “The European Origins of Economic Development,” was written by New York University’s William Easterly and UC Berkeley’s Ross Levine, who set out to build a new comprehensive database of the European share of the population in the early phases of colonization. It also looked at the impact of the settlers on the former colonies’ economic development today. A large number of commentators generously congratulated the authors on being obvious, wrong, and racist. You may find the NBER link to the paper above to be restricted. If so, here is an unrestricted link.